What I Wore On Christmas Day - CounterCultural. CounterCouture. Ahhh, Christmas Day! That special time of year when family come together to engage in food, fun and films. When dressing it is important to take this elements into account, for which I know many people chose their pyjamas or ‘lounge wear’. However, I also have to factor in church and the need to at least appear presentable. Admittedly this does lead to me feeling overdressed when everyone else is in flats, but if you can’t wear heels at Christmas when can you? 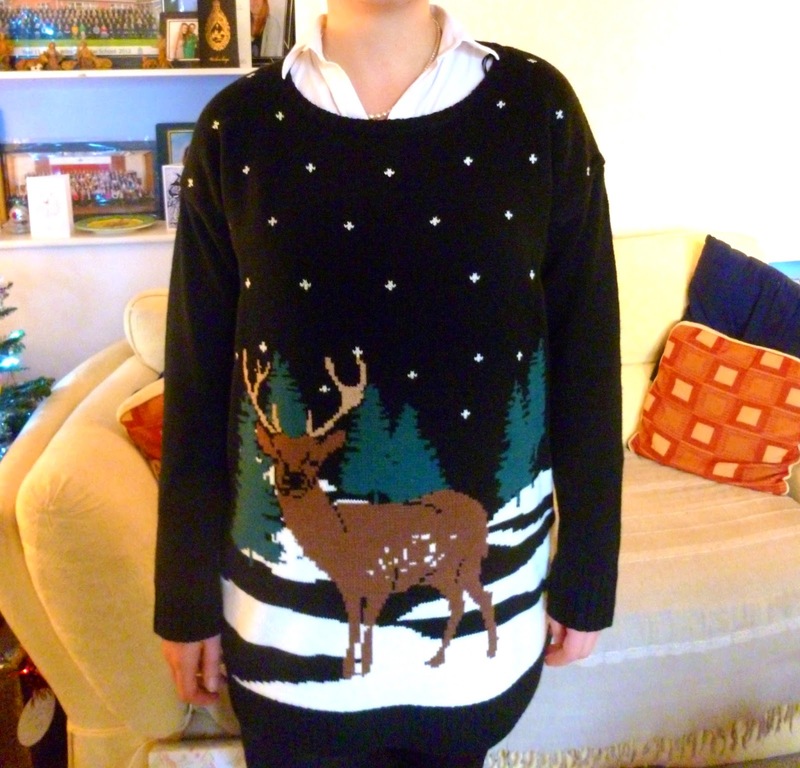 When I originally bought my Christmas jumper (here), I knew it would work with a collar and leggings. In hind sight, a bowl-shaped peter pan collar might have worked better but I love a good shirt. This Zara one was originally an interview purchase but is ridiculously comfortable and even a little loose now I’ve lost a few inches. Overall, paired with my brogues and wet-look (closest I can get to leather currently) leggings I felt festive in the most grown up way. So it was a little on the monochrome side but I like simplicity and you don’t need colour when you have a stag majestically staring at everyone. It’s not often I shop at Peacocks but I am so glad I bought this jumper. Christmas Day itself was an interesting affair as I ended up cooking Christmas dinner due to Mum being taken ill. It turns out leggings and jumpers are brilliant for cooking though I did find myself getting too warm at times. Fortunately, the goose turned out well and the braised cabbage (thank you Delia) was as delicious as when Mum cooks it. Essentially, the festive and sartorial side of Christmas was a success. I’ll fill you in on the rest of the holiday season soon. 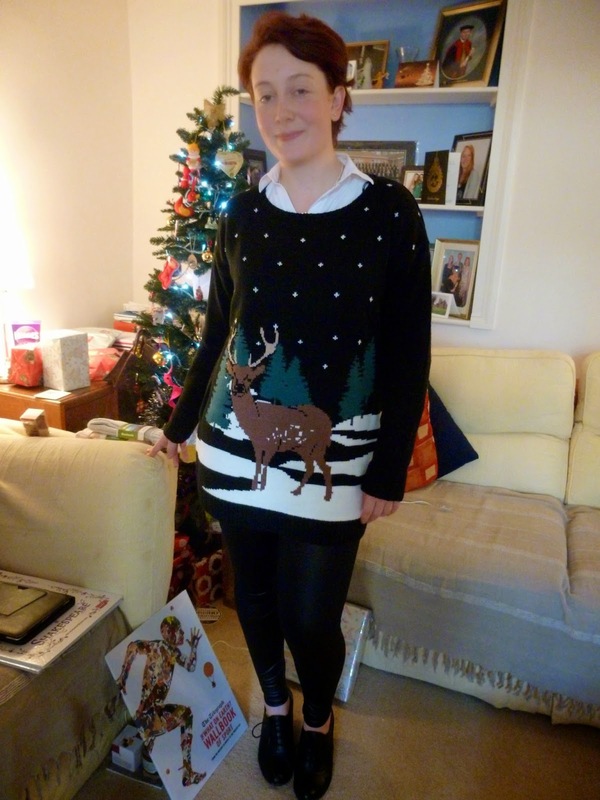 The post What I Wore On Christmas Day was first posted on CounterCultural. CounterCouture.